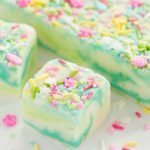 Pinterest was my inspiration to make this Spring Fantasy Fudge. I don’t know about you, but I think Pinterest can be a bit dangerous. I can get totally lost in all the wonderful creations and spend WAY too much time in that corner of the web. But it’s a fabulous place to get ideas and Pinterest really tends to get my imagination going on a wonderful roll. For example, I couldn’t take my eyes off this beautiful candy bark and decided to check out the recipe. I loved the whole concept of a delicious, whimsical, fun, spring confection. But when I saw that the recipe used candy melts, I was a little disappointed. Though I love the fun colors that are available in candy melts, I really don’t care for the flavor. 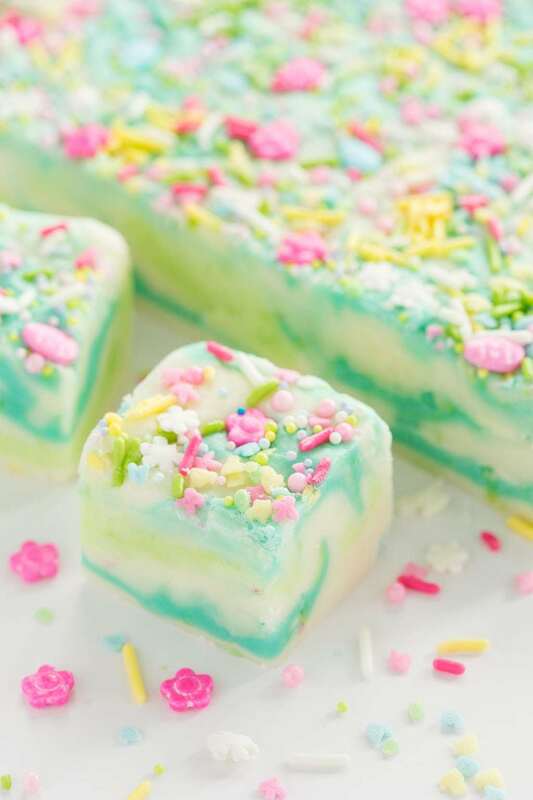 So I started thinking and throwing around ideas, and that’s how this delicious, whimsical, fun, Spring Fantasy Fudge evolved. Thank you, Pinterest! And I don’t even mind telling Scott that I got lost over there! My personal spin on the Pinterest inspiration ended up being fudge. And fudge made with white chocolate is a favorite, as there can be so many fun variations (like this or this). That being said, it’s important to check the ingredient list carefully. A good quality white chocolate chip should have cocoa butter listed as one of the first few ingredients. Next time you’re shopping, check out the white chips – you’ll be shocked at how many “premier” chips don’t have any cocoa butter! I really like the chips from Trader Jo’s (made with real cocoa butter, real vanilla extract and no artificial ingredients). They also melt better than most other varieties. They’re not always available at the TJ stores, so I was happy to find them available on Amazon! Although lemons are in season all year long, to me the lovely flavor of lemon seems to shout “SPRING!”. 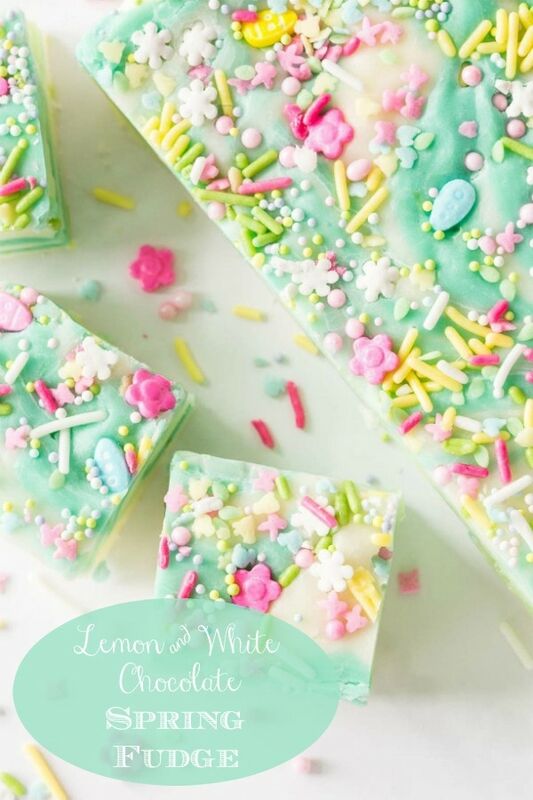 I’m crazy about the pairing of white chocolate and lemon, so I added lemon zest to my Spring Fantasy Fudge. The super fun part of my fudge creation came next. 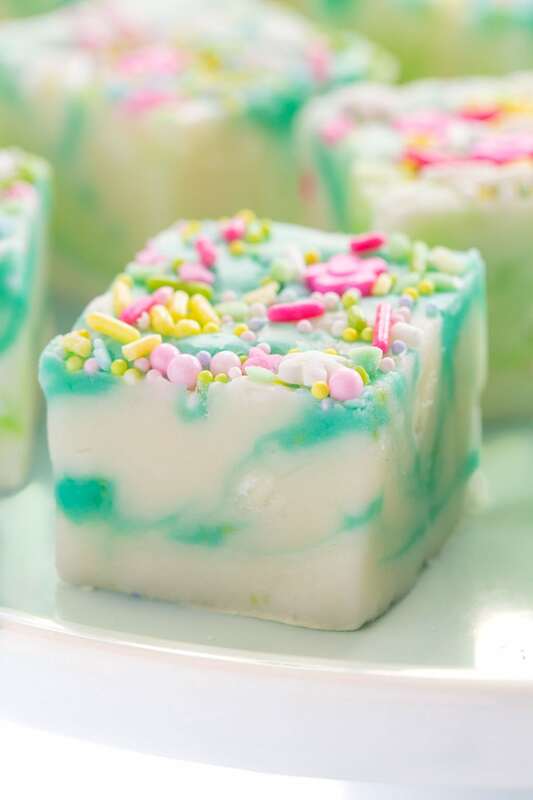 It only took a few drops of food coloring to create this beautiful, pastel swirled Spring Fantasy Fudge. I chose turquoise and green, but you can experiment with your favorite spring colors. 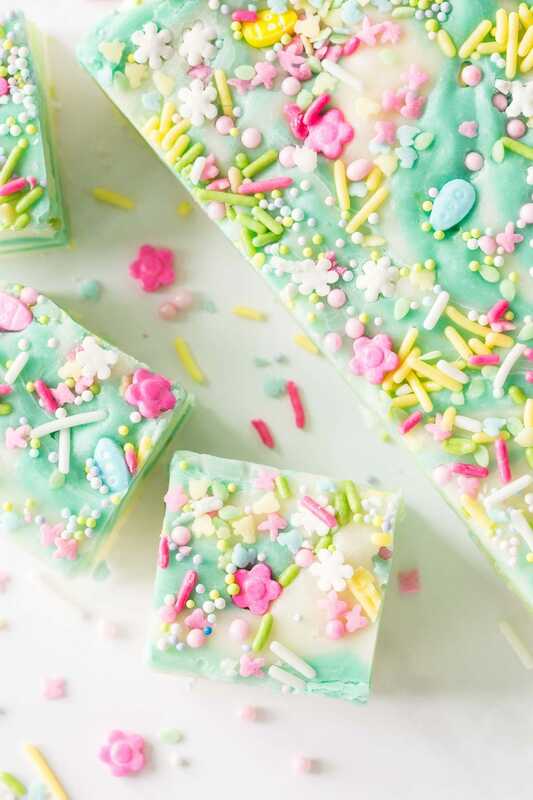 You can stop right there and have a lovely spring fudge, perfect for nibbling and gifts, but give the finished fudge a scatter of jimmies, sprinkles, nonpareils and you’ve got a sweet confection that even Monet would have been proud of! Be prepared for that same kind of exuberant response when you make your Spring Fantasy Fudge! Take some pictures of yours and share them over on Instagram with the hashtag #cafesucrefarine . If you live outside the U.S., you may not be familiar with half and half. It’s a convenience product frequently used in coffee here in the States. It’s simply half milk and half cream. I Love the white chocolate chips from Trader Jo’s. They’re not always available in the TJ’s stores but you can always find them on Amazon. Trader Jo’s White Chocolate Chips. Marshmallow creme is a light, creamy marshmallow mixture that’s sold in jars. If you can’t find it, you can make your own. Try this version from AllRecipes. I like to use a long, sharp knife to cut my fudge. I dip it in hot water and wipe it dry with a paper towel between cuts.The recipe will yield 64 1-inch squares. The most fun, whimsical, delicious fudge to celebrate any special occasion with. This one seems to shout "Spring"! Line 9-inch square pan with foil, with ends of foil extending over 2 of the sides. Spray foil and sides of pan with cooking spray and rub to cover evenly with a paper towel. Set aside. Also spray a small thin-bladed knife with cooking spray (a butter knife works well for this). Set aside. Remove 1/4 of the mixture to a small microwave-safe bowl. Remove another 1/4 to another microwave-safe bowl. Add one or two drops of food color (your choice of colors) to each small bowl (I used two drops - one bowl I used a drop each of blue and green to create turquoise and in the other bowl I used a drop of yellow and a drop of green to create a spring green color). Stir both bowls until well mixed. Do not add color to the remaining mixture in the saucepan. Pour approximately half of the plain mixture into prepared pan. Add about half of each of the colored mixtures in random spoonfuls over the surface. Then add the remaining uncolored fudge batter. Now add the rest of the colored batter, again in random spoonfuls. It's fine to leave areas of white showing. If any of batters start to thicken you can pop them in the microwave for 10-15 seconds to loosen them up. Using the thin edge of the prepared knife, run it back and forth a few times through fudge creating a swirled pattern. Once you get a pretty swirly pattern, stop. If you swirl too much the whole mixture will run together into one overall color. Quickly sprinkle the top with jimmies, sprinkles, nonpareils, etc. I like to sprinkle them in little clusters, sort of like flowers would grow, rather than an even sprinkle all over the surface. Cool completely and then cut into squares. I find the fudge cuts better if I don't refrigerate it, just let it cool for a few hours at room temperature. Use the foil handles to lift fudge from pan before cutting into squares. Just wanted to let you know, my 9 year old daughter chose your recipe to bake for our state fair open class “fudge” class. She won first place! Thanks for sharing your recipe. That’s awesome!! Tell her congratulations!! Do you have any pictures? This looks and sounds fabulous!! How long will the fudge keep? One week? One month? What is the best way to store? I would like to package these as small favors/gifts for family reunion. Many thanks in advance for your response and most of all your creativity!! Hi Barbara, this fudge will be fine for a week. You could also make it ahead and freeze it. Enjoy! Thank you so much for this! The little tips (buttered skinny knife & when boiling time starts) were especially helpful. It’s cooling (at room temp) now. I”ve made various kinds of “white” fudge and it looks like this is the keeper. Is actually in “white chocolate chips). Can’t wait to try this! This fudge looks beautiful and whimsical Chris (and Scott, I know you are reading this too ;D)! A perfect treat for spring parties and holidays. Happy Easter you guys! Made this fudge this morning for Easter baskets and it is really pretty. You don’t say when to add the lemon zest, so I put it in with the chocolate and marshmallow creme. Other than giving me a serious sugar high, I really like it. Thanks Peggy, you added it at the right time. I’ve corrected the recipe. 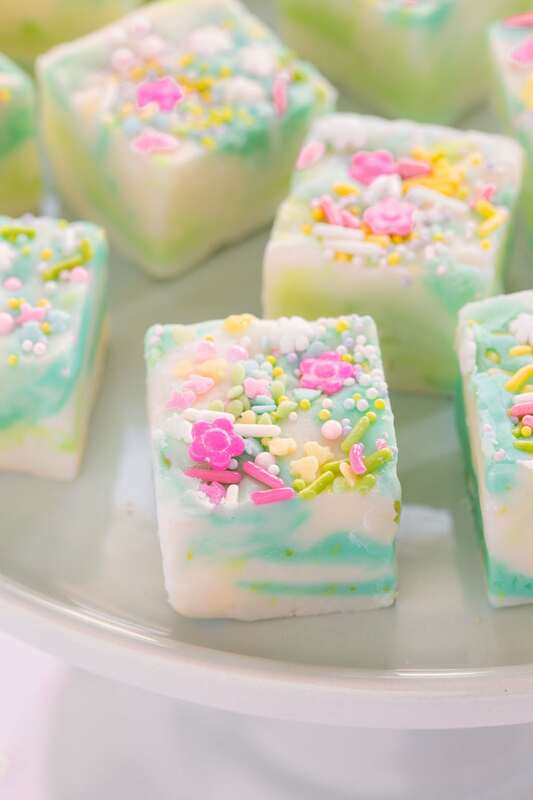 Such pretty and festive fudge, I know your grand children would be giddy with excitement to find this in an Easter basket! These look so adorable! 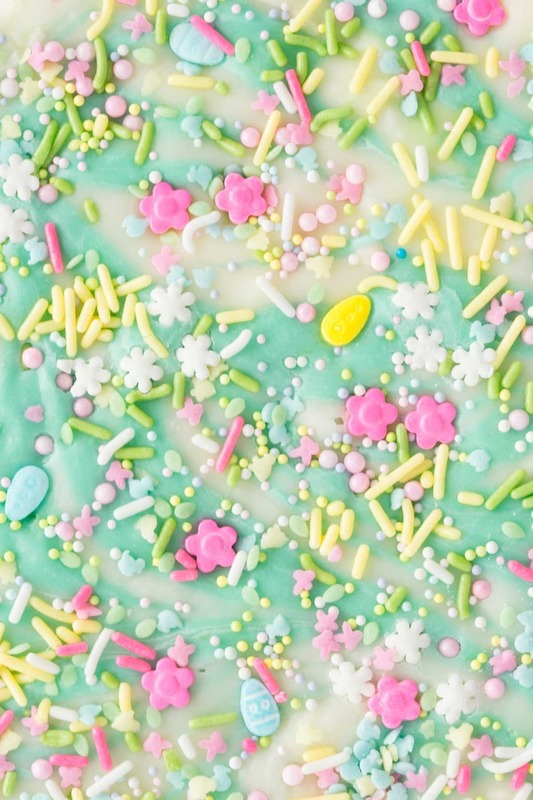 Love the spring vibes with the colors and sprinkles.